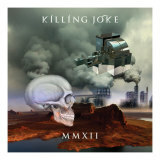 While not firmly in the "metal" category, Killing Joke ought to be a must-listen for any dedicated metal listener. Their influence on metal (and punk, New Wave, industrial, techno, and synthpop) has been tremendous, their output unstoppable (this is their fifteenth album), and their new albums as fresh and as interesting a listen as their originals. They also seem to be getting heavier with age, and MMXII, their newest, is no exception to a truly legendary career. Jaz Coleman's lyrics of dystopian futures, paranoia, and transhumanism get a new outlet in our latest apocalypse-that-didn't-happen: The rollover of the Mayan calendar cycle. The album title and the first track, Pole Shift, provide a sort of prologue to the rest of the album -- while I wouldn't call this a concept album, the songs do share a common thread, of change triggered by an unstoppable natural event, sweeping away the old order in a blast of fire and producing a paradigm shift in humanity. It starts quietly with synth keyboards, much as the depicted event might, building to an industrial attack of guitars, in the longest song of the album. It quickly becomes clear that the tone and emotions of the songs are set as much by the musical content as the lyrical: FEMA Camp starts with creeping menace and proceeds with a measured, almost doomful pace, Rapture's techno beat paints an opposite picture of blankness and escape, and In Cythera's fast-paced but soft with a hint of sadness. Every time I felt that I finally had a general feeling for the tone and sound of MMXII, the next track turned to a different sound palette, but with an central theme and sound that immediately put Killing Joke's stamp on it. Coleman's vocals follow the music and blend perfectly with his keyboard synth, starting soft and clean, and building up to a chaotic roar as Geordie Walker's guitars kick in at full blast. The melody of the songs, even on the most monotone, keeps a fine edge on the noisiest parts without letting it grow out of control. Despite the ever-present darkness, grim overtones, and general heaviness of the album, this is as uplifting as it is doom-filled, leaving a feeling of relief and catharsis as the listener exits the harsh territory of Glitch and Trance for the softer, melodic finality of On All Hallow's Eve. As in their previous album, Absolute Dissent, there really aren't any songs that one can really find fault with, and there isn't anything on here that I could consider filler. There are tracks here for a devotee of metal, punk, techno, and industrial, but regardless of particular musical leanings, all of the tracks contribute greatly to the overall album. This masterpiece is a clear indication that Killing Joke shows no sign of slowing down, changing its musical philosophy, or compromising the heaviness of its albums any time soon.